Hopefully you would read our advice on cures and enhancers for 2006; if not please follow this link for more details. 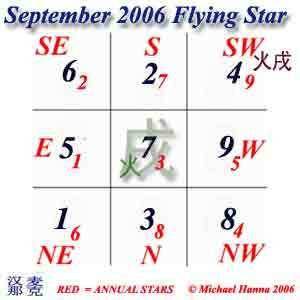 From 7th September to 7th October 2006 is the eight month of the year of the fire Dog (Bing Xu) with the ruling energy of #7 in the central grid. Northeast – Those who have a front door, office or a bedroom in this sector of the property, may find fame and recognition this month. Possible joint ventures or new business plans may appear when least expected. To enhance this month place a brass Dragon here or a metal wealth pot. To enhance family and romantic relationships place a wooden Wu lou along with a brass Dragon headed Tortoise if you have one. Beware of possible headaches when over worked, so pay good attention to your health. Drink lots of water, no matter how busy you are, as dehydration can cause headaches. Take time off to rest your eyes from the computer screen to avoid migraines. This is also a great area for those in studies. Students will do better if they use this room for their studies. To further enhance, place a crystal globe on their work desk. For anyone in a power position like a politician or company owner/director with a door in the northeast will do well in September. Southeast – Although this area is visited by a fairly auspicious monthly energy it is held back by the negative influence of the annual #2 star. Just make sure you have your annual cures in place as this will take care of this part of the home or office. If your front door is in this location of the property, the month’s influence may benefit those in the real estate business or those trying to sell or buy a house. It is also a good location for those looking to venture into a new partnership or business. However, remember that this is a very afflicted sector for the year 2006, so whatever good tidings the month’s energy may draw; it comes at the expense of your health. Migraines, headaches or, at worse, head injuries are common occurrences when these two stars meet. Do not use red in the general décor in this palace. Metal cure should be in place to negate bad monthly stars during the year. Southwest – A wonderful sector for couples as this is a good sector for building relationships. Marriage may also be a possibility when under this romantic influence of the month. This is also a good sector for those who are preparing for exams. If your bedroom is in this corner of the house, place something blue, e.g. throw over, rug etc, in the north corner of the bedroom. This is a good sector for those who are looking to tie the knot or for whom romance is on the agenda. The energy of the month is very conducive for building long term relationships. You can place your mandarin ducks or rose quartz double hearts here to remind you of this romantic influence. A lovely influence also for those who are in the creative field from writers, artists to architects. If your office or study is in this sector of the house or office, the influence of the sector may propel your ideas into reality. This is the month to work hard and pen ideas into proposals and make use of this wonderful influence for future success. Romance is also dominant in this sector, so for those who occupy a bedroom in this corner of the house and are single, enjoy. This is also a good sector for those who are preparing for exams. You should place some romantic symbolic items like a pair of Mandarin Ducks or a hugging couple in the southwest this month to enhance romance. Northwest – Success is expected this month for those occupying this sector of the house/building or office and this is especially true if you are in the creative field e.g. writers, architects, designers etc. Offices with a main door in this sector can see an upturn in business this month. If your office or study is in this sector of the house or office, the influence of the sector may propel your ideas into reality. This is the month to work hard and translate ideas into proposals in order to take best advantage of this wonderful influence which should lead to future success. Romance is also dominant in this sector and so for those who occupy a bedroom in this corner of the house and are single, enjoy. East – Do not disturb the ground in the east part of your garden this month or conduct any noisy renovation in the north sector of the house or office. The negative aspects of the visiting monthly #5 Yellow can bring obstacles in business or at work as well as illnesses affecting the ears, kidneys and inflammation of the bladder. If you already have metal enhancers for the annual 1 in the east palace, this would be the appropriate cure for the visiting 5 Yellow. If you have not, I would suggest placing some metal decorative objects (nothing triangular in shape, sharp or menacing looking) in the east corner of the room. If you use our monthly cures kit you should place a Wu Lou along with six Chinese coins tied in a row with red ribbon in the east this month, this will weaken the negative earth element. Have extra patience when projects or ideas take longer to materialise than you expect owing to the obstacles placed in our way by the monthly #5 Yellow. If you have a crucial project or critical meetings, do not use the east sector of your office this month. If this is your office, place some metal objects (e.g. metal paper weight, metal abacus, metal tortoise, golden dragon) in the east corner of your desk. Children occupying a bedroom in this palace may suffer ear infections due to colds. Pregnant ladies should avoid this east room for the month and metal cures are recommended for this sector. You can place a golden Wu-Lou or hang a Chinese six coins in the east corner of the room. If there are external poison arrows, for example, sharp roof lines, sharp images or unfriendly structures pointing at your property from this east direction, this may bring fire accidents. Place a Ba Gua outside if your main door is located here. You would be well advised to refrain from using red in the general décor for the month. Place some blue items instead to calm the fiery interaction. If you use our monthly cures kit this is where you would place a Wu Lou and/or six Chinese coins tied in a row with red ribbon. South – Health related issues such as coughs, sore throats and lung problems may crop up. If this is where you spend most of your time, you may experience a feeling of lowness like being dragged down. Place six Chinese coins in a row tied with red ribbon along with a Wu-Lou by the bedside if this is your bedroom or study. If starting a family is one’s objectives, avoid using this bedroom as it is not conducive to conception. Pregnant ladies should also be careful with this combination of qi. The northwest or northeast is a better room. 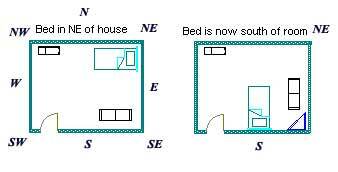 If you cannot move bedroom, try to sleep in your Tien Yi or Yan Nien direction. If your kitchen is in this sector of the property, take extra care when preparing hot food or handling hot equipment. Possible fire hazards are possible in this sector of the house. If you spend a considerable amount of time in the kitchen, you must be aware of the possibility of being burnt or scalded. Cook or work with care and do not rush. If this is your bedroom or office, you can place some metal objects in the south corner of the room or place a golden Wu Lou in the south corner of your bedroom if your bed is also located in this corner of the bedroom, especially if you suffer from sinus problems. If you use our monthly cures kit you should place a Wu Lou along with six Chinese coins tied in a row with red ribbon in the south this month, this will weaken the negative earth element this month. North – Children with a bedroom or study here may experience difficulties at school. Those occupying a bedroom here may also experience ailments such as back pains and sinus problems. Place something red (e.g. a red lamp, a rose quartz crystal or a red rug) in this room to calm interaction. Keep an eye on younger children starting new schools this month. Those with main or back doors in this palace must take extra security measures as burglary or robbery is indicated. If your bedroom or office is located in this sector, be careful of what you are signing, especially with contracts, as the influence in this palace carries with it possible law suits. West – This being the location of the annual 5 Yellow, its malevolent influence is enhanced by the visiting monthly star #9. Those with a bedroom or office here may encounter minor setbacks or small losses due to poor health. However busy you are during the month, take good rest especially those with a history of eye or cardiac related illnesses. Please make sure you have some metal cures in place and at the very least a set of six Chinese coins tied in a row with red ribbon and a wu lou. I hope you find this September update useful in keeping you informed of which sectors are potentially influenced by positive or negative qi. Please remember this is only the monthly good or bad influence, you can enhance and cure even more by following our 2006 annual advice, follow this link for more details. The cures and enhancers for 2006 can be placed at any time of the year. Example: If you or your child are in a bedroom in a bad area of the home this month, get your compass and stand in the centre of your room and place the bed or desk in a more auspicious area for the month as mentioned above.